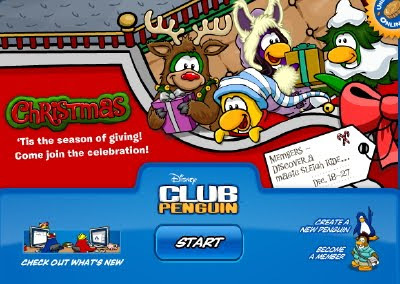 Club Penguin Cheats by Mimo777 Club Penguin Cheats by Mimo777: Club Penguin Christmas Magic Sleigh Ride! Oh yeah, Rockhopper is getting closer! Woot! well not true. the people in the clubpenguin team need to make money to live thus they need to do more things for members so that they will stay members so the people in the clubpenguin team can make a living!!! that sleigh ride looks cool. hope it is better than the festival of flight balloon ride. I really dont like that CP is making only member things! that is soo unfair! members only at the christmas party!!? I am a member and i agree that that's soooo unfair! Mimo i think that the sleigh ride will be like the hot air balloon ride from the festival of flight except it will be a sleigh! lol mimo does "sleigh" mean santa's sled or something? And we can go sit on his lap lol! Totally random moment at school yesterday, I said to a girl (when it was really cold in the UK) My legs are really cold. It was totally random because we were talking about Food! Grr my memebership will be gone i better get it back! you might get to go on a giant tobbogan and ride down a mountin! and for narutojudo, just become a member! and IM mimos biggest uk fan! I LUV UR SITES MIMO!! Maybe its a magical sleigh ride to an awesome santa themed room! I bet we get to go to the tallest mountain again! Mimo theres a new catolog! I hope my member ship doesn't run out before then!!! Well the main reason why is that, in 2005, Club Penguin was bought by Disney for $350,000,000. So Club Penguin's doing more member stuff so they could earn another $350,000,000. Throw a sno ball in the box dimention its so cool! Exactly what i was thinking but i heard that it takes you to rockhopper island.Anyone heard the rumor.i know it wasent a question but im sure everyone wants to know more info. It looks like it will be on Rockhopper's Ship. "psssst" Am i a mod yet! WHOE THAT PROBALY MEANS WE CAN GO SEE SANTA PENGUIN!!!!! I think it is like the ballon ride from the festival of flights. We go on the sliegh ride and we end up somewhere and there is a member free item. Maybe it will be like the Hot Air balloon but with a sled! Mimo rocks!Only if CP had more nonmember stuff.Rockhopper is in the telescope and he is really close! I know, me either! I can't WAIT! YAAAAAY! I agree. Even though i am a member now, i am not always one. Don't quit CP! Too many people are doing that these days! You should talk to your parents about you earning money for memberships. You could do laundry, clean cars, some extra chores you don't normally do in exchange for your parents buying you memberships. Talk it over with your parents! And make sure they know that you can also buy club penguin memberships at stores. Look on the Club Penguin memberships page to see more stuff about buying memberships, like where and how much. Good luck! P.S. if you get allowance, ask them to replace money with memberships if you want! That's what my mom and I are considering. yes, i agree somewhat. Club Penguin needs to get money to back up their site, but i really think they're going too far... i acknowledge furniture and clothes and some member parties and stuff, but i REALLY disagree to extra rooms, extra games, extra everything everywhere! And YES, KEEP THE CHRIST IN CHRISTMAS! The whole point of Christmas is to honor Jesus's birth! Awesome! Is it your first membership? When i first got my membership, i got first-day-member fever! I bought everything in sight then went broke, lolz. Yeah, Santa's Sleigh is his sled... a sleigh is a big, horse- (or reindeer, in Santa's case)drawn sled, sort of. I agree 50% and disagree 50%. First of all, members pay REAL MONEY to get special activities, second of all, the do it to much! That is like the tallest mountain ride! Have you heard that if you only eat carrots for your whole life you would turn green cause of chemicals? I learned that in science class. Hey, Mimo, It's your webosaurs friend, Norris. I was playing CP, and I noticed something in the Dojo Courtyard. On the left are the Volcano and waterfall, and in the top-right, there is a SNOW topped mountain. That means a Dojo for all three elements! We are having a play were people dress up as zebras at my school. Yep, it is a sled that flies. Yep, you got it right. It is a flying sled. My football team is going to a big game soon. So wish me luck! That sleigh means Santa's sleigh the Reindeer's are on! OMG OMG MIMO,MIMO my docter says that if you dont make me a mod immidietly im going to blow up into a million pieces! oh yes! mabe if i get a membership for christmas i will be abill to ride it!!! cool! -Narutojudo (Mimo's biggest UK fan! Well, CP Needs to make money, the only way they can do it is adding more member things in order to other players buy a membership. But I think its unfair too, and I'm a member. figures that 5 days after my membership runs out they have a bunch of awesome stuff for members! It would be funny if you were a member and you were going on a sleigh ride. I hope they bring back the reindeer antlers because the non members could be Santa's reindeer. Imagine you were a member going on a sleigh ride. I wish the reindeer antlers would come back, so non members can be the reindeer of Santa's sleigh. kewl! not sure hat that could mean though... maybe it could be like the balloon ride? hey mods! do u think mimo will be a member to see all this coolness? will u mimo?! yeah :( it is kinda unfair that nonmembrs dot gt to do anything. im gonna send an email to cp telling them to make nonmembers feel wanted too! Isn't Christmas supposed to be a time of generosity and not commercialism? i think that you ride a sleigh all the way you santas workshop, or something like that! Well not. Club penguin is a company and they are trying to earn money. If you're a nonmember and you can whatever members do club penguin wouldn't make any money. So they do all this fun stuff for MEMBERS ONLY! it looks like rockhoppers ship? look sneat ill keep an eye on it! Yup, Rockhopper always brings awesome stuffs, like Treasure Hunt the game. And remember, it always, ALWAYS comes on Fridays at 9-9:30 PM Penguin Standard Time. In fact, almost every update happenes on Fridays, therefore I'm almost always there when a party, catalog, Rockhopper, or special thing arrives. It's awesome! :-0 Rockhopper is a famous special guest penguin that comes every 3-4 months! He always brings his Migrator with him and his puffle Yarr! He also wears and a black beard and a pirate hat! Now everyone can go on!!! i think it might be a ride to santas village! I think its unfair to but you paid for your membership and use while it last but I am a member and I see alot of non-members who fell bad for not having a members. awesome! sadly my membership expires on the 11th. i could just buy another card. I HOPE THE SLEIGH RIDE IS FUN! I think ita good that CP is giving alot of member stuff because we pay to be a member. They finally realized that we need to be getting are money's worth. mimo u still havent put up my theory. In the yeti cave back when the maze was there, at the entrance and exit there are bear tracks. Herberts! please post. He gives free stuff to non-members but also has stuff for members as well, he awesome! No fair! Member always get cool stuff! It's totally unfair! Club Penguin is going overboard with the member ONLY stuff! Why did they make the memberships in the first place? I wish the penguins were all treated evenly! You know I think there trying to get more people to buy memberships! My family can't afford a membership. Club Penguin should stop with the memberships and everyone would be even. A multiplayer game where you find gems and coins and the rare green gem in rockhopper's ship. It will have a sandbox then click on it and you will start playing. He's a famous penguin that looks like a pirate with an eye patch, black hat, and I think a parrot. If you see him there will most likely be a huge crowd around him, don't forget to get the free item by clicking on his player card. It's an activity where you can donate your cp coins for three causes then clubpenguin donates real money to those three causes. Something...just kidding, a sleigh is like a flying sled with the help from Santa's reindeer. I think it'll be like that hot air balloon ride except it will take us someplace cooler than that lame laboratory. He is a super famous penguin. Here's the "speech" that a lot of other penguins and me have givin lots of times. Everyone knows that some family's can't afford membership, but that's the only way cp can keep on running. Money doesn't just fall out of the sky. And since there is so many servers on cp it costs more to run the website. I would rather go through all this membership stuff than to be clubpenguinless. Im a member but, Basicly every party that cp has now has a member room. This is probably going to be like the festival of flight with the jet pack thing.